Blue Line Oasis consists of several art elements. A large mosaic and stone “well” greets passengers as they enter the station. The area is landscaped with tall palm trees like a desert oasis and the well is a symbol of soothing refreshment of body and spirit while also serving as a circular seating area or gathering place for passengers waiting in the park & ride area. Steel and copper replicas of coins appear to have been tossed into the center and reinforce the idea of a wishing well. Etched along the pathway into the station are strips of blue concrete pavers with poetic references to our universal human longings and emotions through metaphors associated with water. 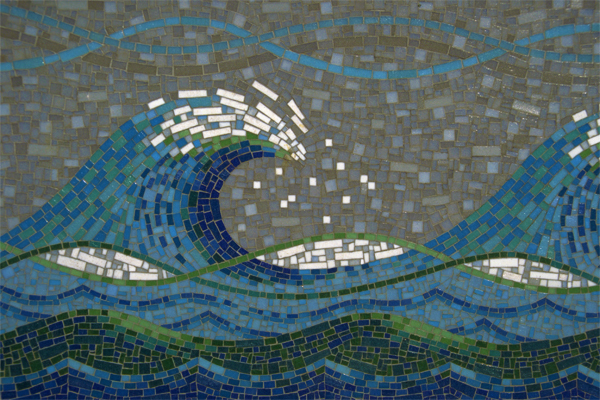 The strips of text lead the viewer toward a low wall of blue and green mosaic tile images of breaking wave patterns. The waves are directed toward a serpentine walk leading up to the station platform where a steel kiosk displays ceramic tile “wishes” gathered from children and youth in the community. "In my work, I explore the metaphors inherent in everyday objects, in particular sites or situations, and in our natural surroundings. So I was attracted first to the name of this station, Artesia, which means ‘…a place with a well where water rises to the surface from its own internal pressure.’ From there I drew metaphors for contemporary urban experience and our constant striving for renewal." LYNN ALDRICH was born in Bryan, Texas, but grew up “all over the map” in an Air Force family that was often transferred. Aldrich received a Bachelor of Arts in English Literature from the University of North Carolina. After deciding to become a visual artist, she received a Bachelor of Arts in Fine Arts from Cal State, Northridge, and a Master of Fine Arts from the Art Center College of Design in Pasadena. She often employs wry humor in her work or uses banal or ephemeral strategies to acknowledge our impermanence and to hint at spiritual significance. Aldrich has exhibited widely in galleries and in such spaces as the Santa Monica Museum of Art and the San Francisco Art Institute. Her studio is in downtown Los Angeles, and she is an instructor at Art Center College of Design in Pasadena, CA.